Betrayed by the ruling families of Italy, a young man embarks upon an epic quest for vengeance. To eradicate corruption and restore his family’s honor, he will learn the art of the Assassins. Along the way, Ezio will call upon the wisdom of such great minds as Leonardo da Vinci and Niccolo Machiavello—knowing that survival is bound to the skills by which he must live. To his allies, he will become a force for change—fighting for freedom and justice. To his enemies, he will become a threat dedicated to the destruction of the tyrants abusing the people of Italy. My review: I found this book really hard to get into. Having played the games I knew roughly what to expect when I read this book but I didn’t expect it to be so hard to get into. I’ve been a die-hard fan of the Assassin’s Creed games since we first met Altair in Assassin’s Creed back in ’07. 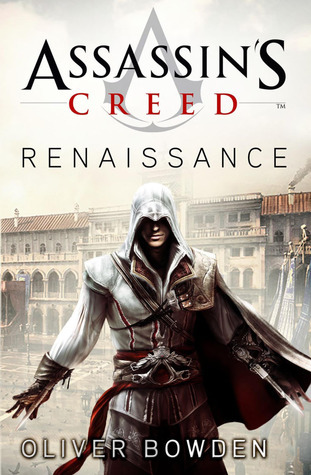 Assassin’s Creed: Renaissance closely follows Assassin’s Creed 2 (and by closely follows I mean pretty much word for word) with a few added extras thrown in there in terms of description. To be honest, I don’t feel 100% comfortable reviewing this book as I feel a little bit biased towards it. I liked the way that Oliver Bowden has written the characters – they are just how they are in the game and they didn’t differ overmuch which is a plus for me. The setting and scenery once again was pretty much like the game, however, I felt that perhaps there could have been a bit more fleshing out of the primary and secondary characters and could have done with a bit more fleshing out in terms of the areas that Ezio visited. In theory it was a good idea to write the books, but in practice it may have been better if the books were released before the game was released so that people could read the book first, get a feel for the situations and the emotions and then be able to kill Templars indiscriminately. I did like the book and I liked all the characters but I’m too stuck on the visual appeal of the game itself to be able to warrant the book anything more than an “I liked it” 3 stars. I’ve already seen how everything looked in that period and heard how the accents were supposed to sound. Admittedly, I did like seeing the spellings for the Italian words and names of places. Speaking in terms of the writing style, it was well written but did have a few times jumps with barely any indication that the time period had changed except for a few small hints here and there. I loved Leonardo’s character in the game and I thought that Bowden portrayed him well in this book also. Ezio was also well portrayed but there were a few changes in the book that didn’t line up with the storyline in the game which put me off a little bit. I didn’t like how Ezio introduced himself to people though: “I am Auditore, Ezio.” I never once read him introduce himself as “Ezio Auditor da Firenze” which has been in the games and trailers; there were also slightly more sexual innuendo and connotations than in the game and a LOT more foul language. I have the rest of the series and I plan to read them eventually, I just hope that they are not as hard to get into as Renaissance was. Since you said it pretty much follows the gameplay, I think I might enjoy it, however, I’d like to see an entire book with more than just that, one that explores it a bit more.